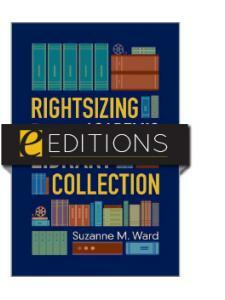 By learning how to rightsize, you will ensure that your institution's collection meets the needs of your library's users. "As a recognized leader in the area of collection management, Ward provides both strategic and practical advice for developing and implementing data-driven, rules-based projects that include print and electronic formats. The final chapter on the future of physical collections in academic libraries is especially thought provoking … Recommended reading for all academic librarians and library managers." "Critically important for professional librarians charged with maintaining the standards of an academic library, as well as an addition to university level Library Science curriculum supplemental reading lists." 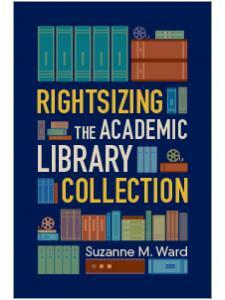 "Along with outlining the necessary background, Ward identifies each potential stakeholder's reaction and highlights various pathways librarians must take in order to continue moving forward … Unlike other books of this kind that focus mostly on philosophy and theory, Rightsizing the Academic Library Collection provides a realistic blueprint to effectively start and finish this massive undertaking." "Contains the practical elements of weeding both book and journal collections ... Recommended." "An excellent resource for any library considering a major weeding project in the near future. The figures and examples scattered throughout are perfect for libraries looking for ways to justify decisions, as well as offering firm rules that can be referred back to should others question the choices."